Bridgit Hayes and Madeline Kotwica at Ronald McDonald House. The commitment to service continued at Mount Mercy Academy in South Buffalo during the cold month of February. 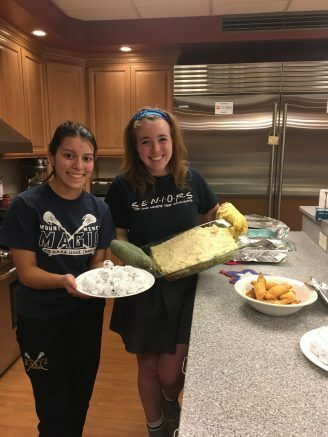 This year campus minister and senior theology teacher Mary Colby is asking members of the senior class to plan and coordinate a service project. The seniors continued their service projects with eight girls coordinating volunteer opportunities. Taylor Stoklosa (Buffalo) and several other students worked with the Sisters of Mercy to create Valentine’s Day themed jars that were used as centerpieces. During Spirit Week, Katherine Pappas of Buffalo organized a drive to support the International Institute of Buffalo. The classes eagerly participated in the drive to collect new school supplies and had the extra benefit of earning spirit week points. This organization provides resources for refugee resettlement in Western New York. Sydni Condoyannis of Dunkirk brought a group of volunteers to the Dunkirk Rural Ministry, an organization that provides hot meals for those in need. This nonprofit organization depends on donations from local partners and including a farm that donates eggs every week. Bridgit Hayes of Buffalo planned a dinner for the residents of Ronald McDonald House. The meal consisted of shepherd’s pie, green salad, crescent rolls and Oreo balls for dessert. Hayes prepped the recipes, helped with the shopping and led the team to prep dinner for the guests. Be the first to comment on "Service continues at Mount Mercy Academy"